Unlike in years past, the judging for the first round of this year's TOP occurred at the shops and, as a result, was not blind. Pizzas are scored in four categories: crust, sauce, toppings, overall taste. The scores from the judges -- each matchup is scored by a panel of 4 or 5 judges -- are combined and pizzas are given a score on a 0-100 scale. And one more note for this particular matchup: J+R of Chopsticks Optional made a special guest appearance on the judges' panel to fill a spot left open by a scheduling conflict. Many thanks to them. This was a tight contest that was ultimately decided by an inconsistent step. 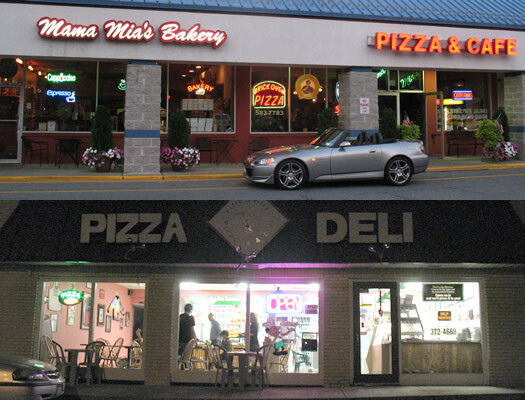 Mama Mia's took the lead in this matchup during the first leg thanks to a good sausage pizza. 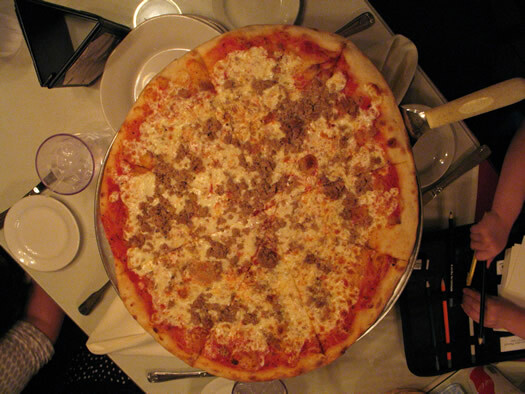 Judges praised its thin, "burnished" crust with "good flavor." Judges said the sauce was applied lightly, and that may have resulted in some noting that the sauce didn't register much -- though one called it "fresh and bright." A few judges also commented that they thought the sausage had inconsistent seasoning. But overall, this pie was praised for being a "good, cohesive pizza." 5th and 50's sausage pizza didn't necessarily light up the judges, but it hit its marks. Judges noted heavy application of sauce and a bit of sogginess in the middle of the pizza. But some praised the crust for a nice crispness on the its edge, and the sausage for its fennel flavor. Here's where things didn't go the right direction for Mama Mia's. A hiccup somewhere along the way apparently led to the pizza not being made the first time with the broccoli on it -- and the pizza was delayed. When it finally appeared, the judges described the broccoli as "steamed," "soggy" and "crying for salt." 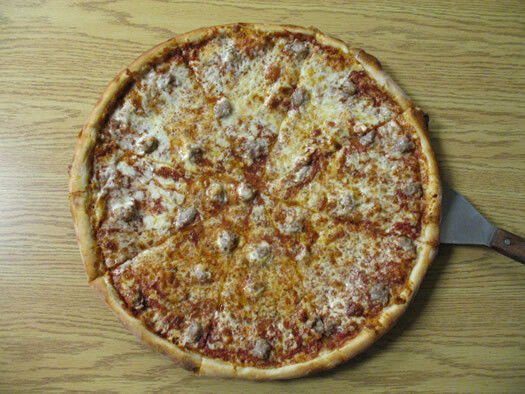 The judges also noted that the crust lacked the burnishing on the bottom that was received so well on the sausage pizza. Whether those two elements were affected by the delay is unclear, but they prompted the judges to give this pie a much lower score than Mama Mia's strong sausage pizza. 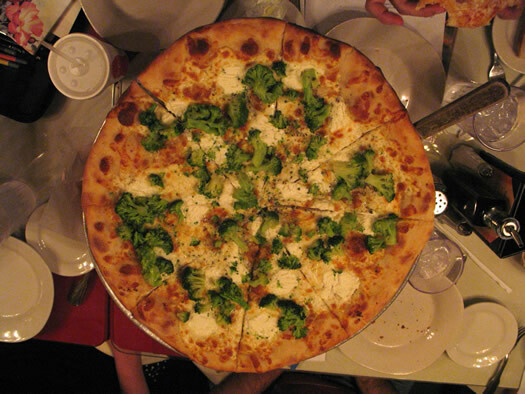 Again, 5th and 50 didn't hit the ball out of park on the broccoli ricotta pizza -- but it made contact. Judges said the crust on this pizza was much crisper all the way through compared to the sausage pizza. Some likeed the distribution of the chopped broccoli. 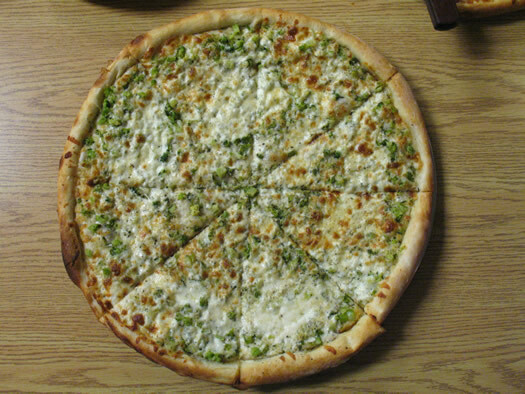 And one noted that the crust/cheese/broccoli combination resulted in a "hearty bite." Even though Mama Mia's produced the highest-scoring pie of the matchup, its second pizza couldn't match the first effort. 5th and 50 advances to the semifinal with a consistent result across two pizzas. Tomorrow: 2010 tournament champ Marino's of Schenectady takes on two-time semifinalist Mario's of Niskayuna.